Radric Davis (born February 2, 1980 in Birmingham, Alabama), better known by his stage name Gucci Mane, is an American rapper and CEO of 1017 Brick Squad Records. In 2005 he released his independent debut album, Trap House, which featured the successful single "Icy" that he recorded with Young Jeezy. He has since released a further three albums including 2006's Hard To Kill, 2007's Trap-A-Thon and 2007's Back To The Trap House. His sixth studio album, The State vs Radric Davis, was released in December 2009, just weeks after he was sent back to prison for 12 months for violating his probation. Radric Davis (born February 2, 1980 in Birmingham, Alabama), better known by his stage name Gucci Mane, is an American rapper and CEO of 1017 Brick Squad Records. In 2005 he released his independent debut album, Trap House, which featured the successful single "Icy" that he recorded with Young Jeezy. He has since released a further three albums including 2006's Hard To Kill, 2007's Trap-A-Thon and 2007's Back To The Trap House. His sixth studio album, The State vs Radric Davis, was released in December 2009, just weeks after he was sent back to prison for 12 months for violating his probation. He was released in May 2010 and will now release his seventh studio album, The Appeal: Georgia's Most Wanted, sometime at the end of 2010. It's said that art mirrors life. In hip-hop's case, there's always been a deliberate entanglement of perception and reality. Fans demand their MCs be realbut never too real. Successful hip-hop is about the hint of the danger, the tease of it, the mystique. Hip-hop is about balance. I wish everybody well who's making money in this rap game, the Atlanta-raised rapper says, dismissing the controversy that followed him in the past. My own rap game is going so good, I've got so many things on my plate at my label, that I don't got time for other people's business. With a deal with Asylum Records as the boss of his own label, So Icey Entertainment, Gucci does indeed have a full schedule with no time to dwell on the past. I live my life with no regrets. I just wish that a lot of things never happened, but anybody can wish, says Gucci. Sounds like a man with his eyes on the prize. And you'd expect nothing less from an artist who ground his way to the top via the hustle of independent records. Signing to Big Cat Records in the wake of his local single Black Tee, he dropped his debut record, Trap House, in May 2005. The independent album moved an impressive 140,000 units, largely on the strength of the Icy single, featuring Jeezy. Clamor over song rights sparked dispute, and the resulting rift grew. Controversy notwithstanding, Mane's independence was cemented: I was on the independent scene for about two years, he recalls. It's crazy! You gotta go into your own pocket to support your craft. You need other avenues to have money coming in, to support your stuff. You might win, you might lose, and it's a gamble out there with the independent circuit. One thing you'd better have is good music because without that, you go downhill fast in the independent game. Good music firmly in hand, Gucci was fast approaching stardom when more tragedy befell him. But let's backtrack; how did the man born Radric Davis in Bessemer, Alabama, become Gucci Mane, mouthpiece for Atlanta stuntin'? Mane remembers little from his time in Alabama, just that it was rural, and that it's changed dramatically since he left at the age of nine. I gotta shout out Alabama though, because they holdin' it down, he affirms. Every time I go there to do a show, I'm impressed with how hip-hop culture has taken root. Mane's identity coalesced when he moved with his mother to Atlanta. I lived all of my adolescent and adult life in Atlanta, he explains. I'm from East Atlanta Zone Six; it was hard, man, it was real rough. I grew up in the Starter jacket era: they'd take your Starter jacket, your 8Ball jacket, they'd take your hat, your shoes. It was just no holds barred on the streets, dog eat dog. If you missed the bus, you had to be crewed up or you'd get jumped. It was wild when I came up. It's a bleak portrait. When asked to describe his home life more vividly, Mane offers a look into his contemplative side, a side honed as a schoolyard poet. I was just a young dude in a single parent house most of my life. I can't complain that much. I would guess it's like any black child growing up in a single parent household. There are a lot of people who know how that is. I didn't have a lot coming up; but what I did have, I appreciated. I was blessed to have a caring mother to raise me right and to help me with my business ventures; she's been there through the whole struggle. There's a lot that goes along with that; it made me who I am today. A stepfather would enter the picture during Mane's adolescence, introducing not only a male figure, but also inspiration for Mane's unusual moniker. My father came in, the original Gucci Mane; that's what people in the neighborhood called him, and that's where I get my name from. From then on, I grew up the son of a hustler and a schoolteacher; it was the best of both worlds because I was educated twice. Drawing inspiration from a pantheon of rappers before him -Big Daddy Kane, LL Cool J, Ice Cube, the Beastie Boys, N.W.AMane went on to release Trap House, a lethal brew of his signature sound: I call my music straight Gucci: going hard and whatever beats you make you for me, if I'm feeling it, if I'm rocking with it, I'm gonna crush it. When you hear me, you hear a lot of pain, a lot of hood; you hear what's going on in the inner city in Atlanta. Unfortunately, Trap House was ill timed; the month of its release, Gucci was accused of murder and jailed for two days. Eventually deemed to be acting in self-defense, and without sufficient evidence to hold him, Mane was exonerated. But the ordeal left an indelible imprint on the man. I learned to keep better company, watch where I go, and be mindful of my surroundings at all times, he reveals. Watch what I say, watch what I do and how I do it, just keep myself out of the wrong crowd. I always stand up man, he continues. I'm one of the toughest guys I know. It'll take a lot more than that to break me down. Undeterred, Mane was back in the studio, preparing 2006's eerily apropos Hard To Kill. The buzz from Hard To Kill vaulted Gucci Mane from regional commodity to national treasure, and major labels responded accordingly: There was a bidding war going on, and I liked Atlantic's approach. They made it known that they wanted me, they felt where I was going and that I could grow with them. Asylum/Atlantic Records welcomed Gucci Mane in early '07, granting him his own imprint, So Icey Entertainment. With it comes an entire stable of artists, the So Icey Boyz. As the Boyz ready for their own exposure -I got them in training; they be in the weight room, pumping iron, doing pushups, shopping at the mall, buying iceGucci is focused on his magnum opus, Back to the Trap House. I started working on the album, and by the third song, I was like This is going back to the Trap House.' I started feeling the same way I did when I made my first album. It had the same feel to it, the same freshness. And I had the same hunger and desire I had when I first started rapping. Since I went major, I want everybody to know I'm still keeping it street, keeping it hood, Gucci maintains. I'm trying to take it back to all my fans that I had when I first started my career. And at the same time, I'm trying to open up my new album to a new fan base. So it's a mix for everybody coming together, like my first album was. Gucci has always prided himself on his innate ability, and his refusal to let guest appearances dictate the tone of his records. I just want people to know I'm a great songwriter, man, he asserts. I'm passionate about what I do, and it's choreographed strategically when I do it. I bring a lot of experience, creative wordplay, and a crazy style. And my albums, I record most of the songs without writing them down; it's a God-given gift and I just get paid for it. It come from God, it's like wondering what makes a bird fly. He made me a poet like the great poets of the past. But don't mistake Gucci's confidence for self-absorption. The vicissitudes of his career have dictated a longer view. Lyrics aside, he's less preoccupied with visible means and more so with acting as an emissary from his under-repped block. I'm not the one to glorify what goes on in the hood, he insists. We have everything there, the whole range from violence to people getting on the bus and going to work. There's a lot more to the hood than just drugs. It's a bigger story, there's a big picture. I went to school in that neighborhood, I worked there, I trapped there, I hustled there, and I got my name there. I'm proud to be from East Atlanta Zone Six, and I claim there. I hold that on my back and carry that, to be the first one from there to really rock. 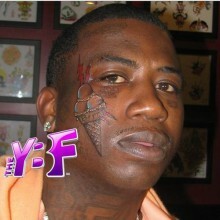 And Gucci's professional aims have matured as well. While other rappers stress platinum plaques, Gucci hasn't forgotten the route he took to stardom. I made a lot of CDs on my own. People fucked with me and supported me, and just made me the man I am today. That's my blueprint right there, and I stay mindful of it. So now, my only concern is that people feel my music; at the end of the day, I do it for people to feel it. If one person feel it, two people feel it, I feel like my job's been done. Fortunately for Gucci, he should be prepared to welcome an army of new fans with Back to the Trap House. But longstanding fans shouldn't fear; they'll recognize Freaky Gurl, reprised from its previous appearance from Hard To Kill. Luda, upon hearing the joint, asked for a guest spot on the remix. Said remix now appears as the lead single on Back to the Trap House, following in Gucci's theme of mating old and new. Over a bouncing, meandering beat from Cyber Sapp, the two cook up the requisite concoction of whips, chips, and chicks. Also look out for Bird Flu, the album's number two single, laced by New-York based Supa Sonics. Elsewhere, firm guest verses from Rich Boy and Pimp C of UGK round out Gucci's regional flavor, while Bay-area producer Zaytoven (of Icy renown) locks down Gucci's West Coast appeal. Gucci Mane has something for everyone, and with the struggles of the past in his rearview, Gucci is settled in for his ride to the top. I'm best known for controversy but I'm trying to gain respect as a songwriter and entertainer. I plan to hit them so hard with this album; who knows what the future will bring. I'll be banging them out till I can't bang no more. Dear readers if you are reading this, you clicked on the subpage of the recording artist gucci mane in our eLyricsWorld. Our database has information about 52389 artists from all over the world as well as 829824 songs 1000 of which are from gucci mane. Besides the the biography of the singer, on this page you can see brief information about them, covers date of birth, genre, label company Be versed in all the events with gucci mane by adding RSS feed. If you prefer you could directly visit the address you are on currently and look through news about the artist. 1017 Brick Squad Records, Asylum Records|Asylum, Warner Bros. Records|Warner Bros.